At some point in the near future (very near, if Amazon has anything to say about it), your washer will automatically order you more laundry detergent when you start to run low. But until that day, you have to lug it home from the store yourself … unless you have it delivered. Both Target and Amazon have “subscription services,” so you can get household purchases you buy regularly delivered. But much like Dollar Shave Club will send razors to your door monthly, Frey Detergent for Men wants to get you on the subscription plan of regular laundry soap deliveries. The appeal is that it’s one less thing you have to put on your shopping list, and it’s a guaranteed way to get around from the spring-fresh scent some detergents favor. 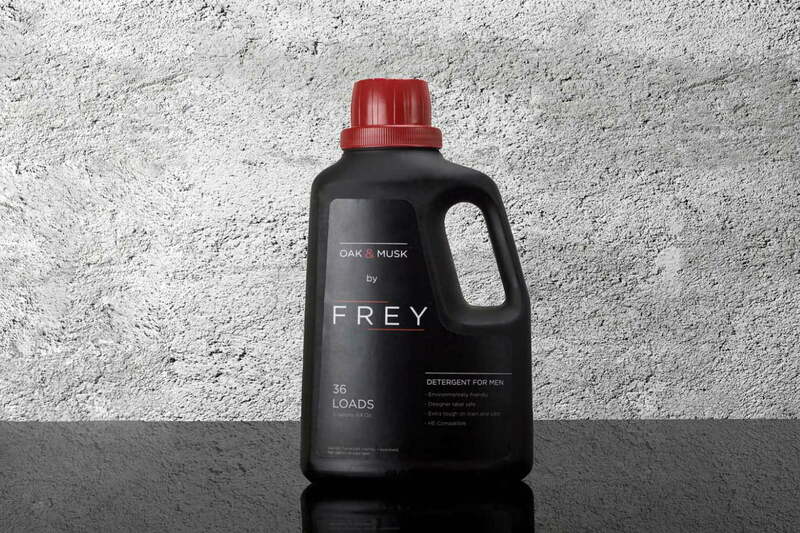 Instead, Frey uses oak, musk, and sandalwood scents. “Our product is for men of all ages and relationship status, and not just men. Women purchase plans for their college sons, their boyfriends and husbands, their brothers, their friends. Women even purchase for their own use because of the cleaning power, smell, and convenience,” says Leif Frey, the detergent’s creator. A “regular washer” subscription plan costs $15 for three months’ worth of detergent, which is actually only a 62-ounce bottle’s worth but includes the $3 shipping fee. Dirtyboy laundry, another dude-centric detergent, sells a pack of three 32-ounce bottles for $28 on Amazon. Both of these are more expensive than your average bottle of Tide, but neither comes close to The Laundress, created by former Ralph Lauren designer Gwen Whiting and entrepreneur Lindsey Boyd. Separating whites and darks isn’t enough for these ladies, who made different detergents for each type of load, as well as one for delicate garments and cashmere and wool. A 32-ounce bottle will set you back $20.50, though it’s supposed to be concentrated enough to last 64 loads. By way of saving your more money, the company’s blog claims that many dry-clean-only tags are a Snopes-worthy myth, and if you do it properly, you can wash these items at home. Some products also go in the opposite direction of its “manlier” brethren, with what some describe as an overpowering flower smell. Some people who shall remain nameless hate doing laundry so much, that they’ll go out and buy new underwear just to prolong the time in between. For these people, there’s Beantown Bedding, which makes disposable sheets. The company claims it saves water (though that doesn’t factor in the water it takes to make the sheets), but what it really does is give you an excuse to not wash your sheets for a month. If you pay $140, you’ll get a set of queen-sized sheets delivered every month for three months. Changing your sheets 12 times a year still isn’t even ideal, so you “mite” still have a problem.